How to add an activity one at a time? I am unable to upload the activity spreadsheet. What should I do? How do i limit the number of attendees in an activity? What is an automatic enrollment in an activity? What does "Visible for public" mean? What is a "Notification of interactions"? Can I send a message only to the attendees who are participating in a certain activity? The agenda is where you place all the activities that you will have at your event. All activities must be between the start and end set date. The number of activities is unlimited and allows you to enter a brief description of each of the activities while also adding speakers, sponsors and unique materials. It is not mandatory, and if your event does not have a schedule, you can disable this feature from the application. A: To add one activity at a time, Click on "Agenda" > "Activities" > "Add Activity". Then add the "Activity title", and "Activity date and time" then click on "Create". A: The import worksheet allows you to upload to the platform all the activities of the agenda at once. 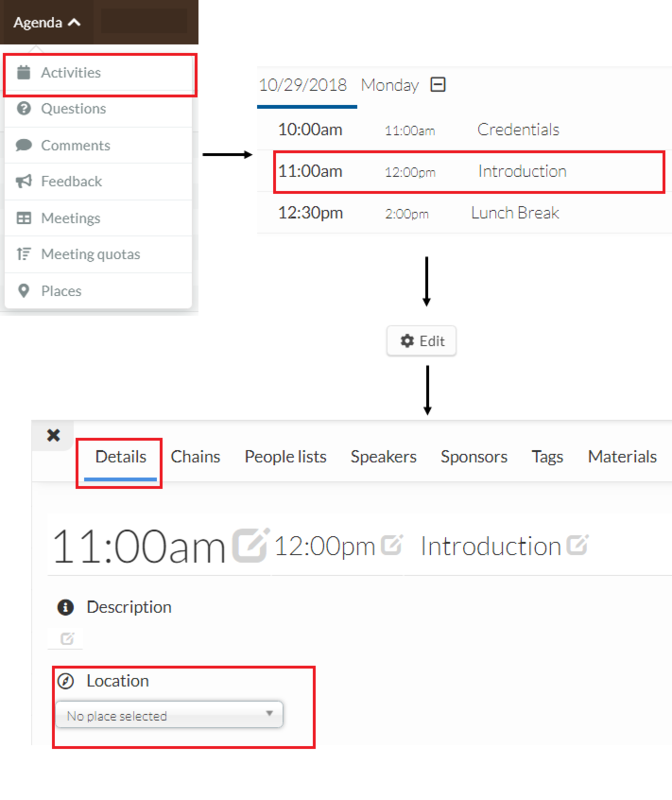 The worksheet collects all the information such as the name of the activity, description, location, start and ends time, and the number of people allowed to register for each activity. It is possible to download the default spreadsheet, : "Agenda" > "Activities" > "Edit" > "Import" > "Download Demo File". 1. An activity time is scheduled in a different time interval as stated in the calendar time. 2. The first row (header and description) was deleted by mistake. 3. 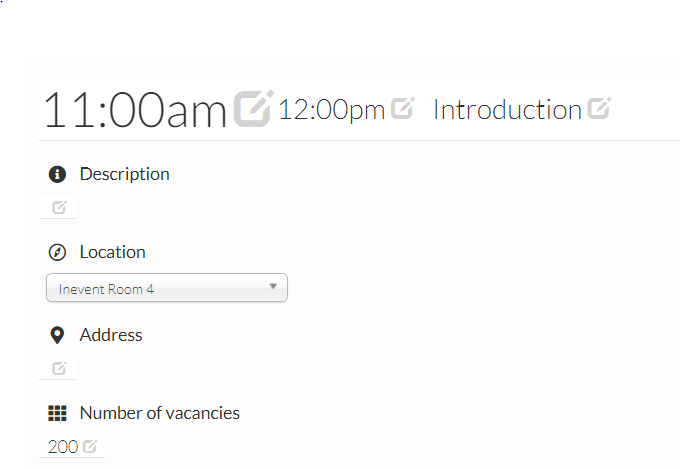 All the mandatory fields should be completed, and possibly one of the field was left in blank (such as: dates, activity date). I added the location of a determined activity, but after uploading the spreadsheet, the location did not appear in the agenda. How do I setup the location of each activity? A: Before importing your spreadsheet, it is important to have set the correct location of each activity under: "Agenda > Places. After this step click on "Agenda" > "Activities" > Select the activity >"Location". Description:brief content about the activity. Location:space where the activity will occur.Before you change, you need to set up the locations for your event.Read more in Places. Address:reference point related to that activity. Note: In the Excel Spreadsheet, this field is populated in the Location column. Number of vacancies:maximum number of registrations allowed. Automatic Enrollment:Every participant of your event will automatically be enrolled in activities where this feature is active. 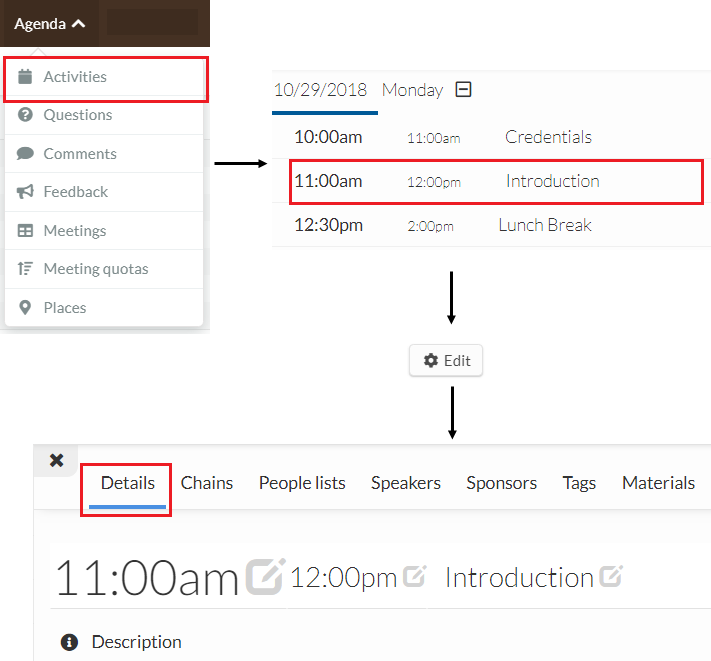 Highlighted position:when enabled, allows your activities to be seen more clearly in the event agenda. Visible to audience: Thismeans that this activity can be seen by everyone who is using the app.If you want only administrators to be aware of a certain activity, you should leave the option unchecked. Chains are constraints between activities in your schedule. In this way, the attendees can only enroll in an activity of the same chain. When choosing, the rest are unavailable for selection. You can link as many activities as needed. Select the activity, click Edit> Speakers Tab . Select the names you want to insert and click Add Speaker . 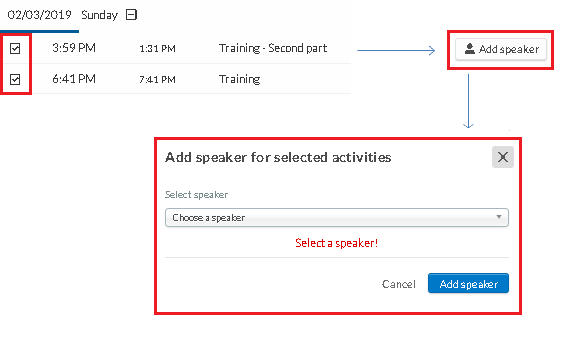 To add speakers to multiple activities at the same time, select the activities, then click Add Speaker. Select the name in the check box and confirm the blue button. Select the activity, click Edit> Sponsors tab . Select the name you want to insert and click Add Sponsor . Click EDIT > MATERIALS. Click the red button and select your document. If you want to delete, click the trash can on the right. You can insert tags by clicking EDIT > TAGS . 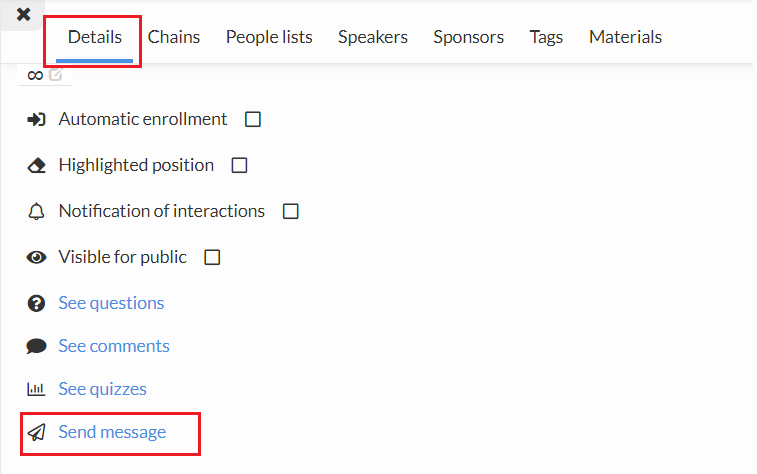 There, you can choose the tags linked to the activity. 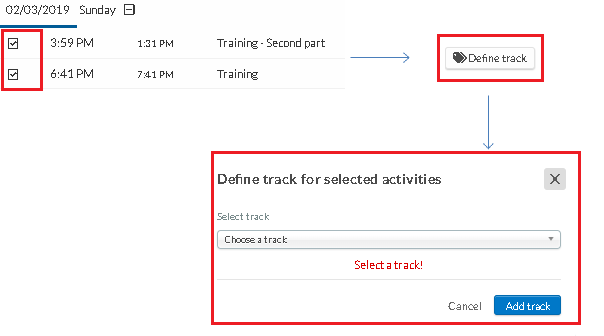 To add labels to multiple activities at the same time, select the activities and then click Define Track. Choose the tag and confirm by pressing Add Track . When there are different schedules for distinct audiences, you can link lists of people to activities. This way, only those who are on the list can see the activity and sign up for it. To select the list, click Edit> List of people and select the list you want to link to. For more information, read People Lists . To set up your custom lists, read Custom List. A: Attendees will receive an automatic notification about interactions added in these activities. If you clear this option, the Attendee will not receive alerts about interactions in the activity. A: Yes. To send the message, please follow the steps: "Agenda" > "Activities" > "Edit". Select the activity you wish to send the message and then click "Send Message". 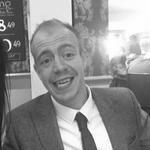 This message can contain up to 140 characters.